Sharp Engineering Ahmedabad stands amongst the prominent Manufacturers & Suppliers of EOT Cranes, Hoist Gearbox, Push Button Stations, Trolley Wheel Assembly, VFD Drives, Wire Rope Hoist and Electrical Control Panel. Our company is certified under ISO 9001:2008 and has a full-fledged ultramodern manufacturing facility. The dynamic duo of the owners, supported by a specialized team of engineers and designers, has taken the company on the path of revolutionary progress and has today hoisted the company to the pinnacle of the industry. Having acquired a consolidated presence, Sharp Engineering Ahmedabad has spread its wings far and wide and has made a name for itself in the market. The foundation stone of the company was laid in 2008 at one of the India's fastest rising industrial cities, Ahmedabad, in Gujarat (India). 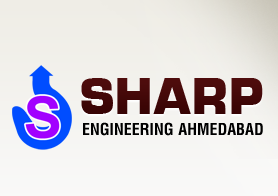 Sharp Engineering Ahmedabad is promoted and managed by the father-son duo, Mr. Ronak Patel and Mr. A. B. Patel. Both of them are technocrats and possess many years of experience and expertise in the field. Under their esteemed leadership and guidance, the company has successfully grown in leaps and bounds. We have a well-designed infrastructure that is segregated into different divisions for smooth and efficient working. We use cutting-edge technology and sophisticated equipment to manufacture our products. The use of superior quality raw materials and controlled production methods has helped us to supply unmatched quality products. A focused approach on Research & Development and keen quality testing have enabled the company to consistently innovate and improve its product line by delivering more features and better performance at lesser costs. Quality holds utmost importance at Sharp Engineering Ahmedabad. The stringent quality checking methods test our products on various parameters such as accurate making, strength, durability, optimum performance, easy maintenance, etc. We are committed to design and manufacture products that provide the customers with dependable operations and years of reliable service.